Location: Near Faverges (which is near Albertville), France. How to get there: This mountain is served by several possible trailheads that all lead to the same final route on the peak itself. A good starting point is the village of Faverges located along Hwy. N-508 that connects Annecy with Hwy. N-212 just north of Albertville. From the main traffic intersection in the middle of Faverges, locate Hwy. 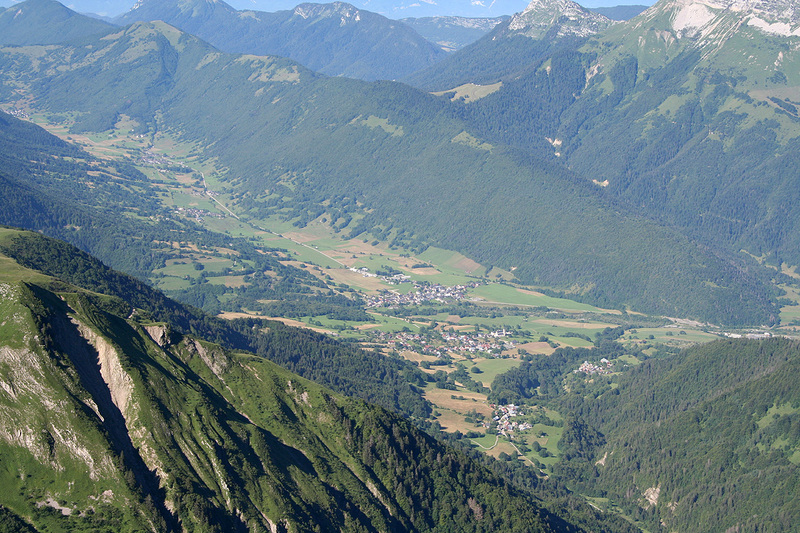 D-12 that heads south across Col de Tamié. Measure from here. Drive uphill and pass through the small village of Frontenex. At kilometer 4.3, make a right and leave Hwy. D-12. After kilometer 5.0, turn right and enter Seythenex. At kilometer 5.4, make a left, you should now be on Hwy. D-112. Continue straight at kilometer 6.2 and continue uphill until you reach a large parking area at kilometer 10.3. This parking serves a small ski area. This is the trailhead, location N45:42.814, E006:16.522, elevation about 1140 meter. Note that there is an alternative trailhead in the valley of St. Ruph, north of the trailhead described above. This trailhead has a somewhat lower starting elevation, but with a more direct approach from Faverges. One may also start south from the village of École, located on Hwy. D-911. From here, one may drive south-east along the river, then more east to reach a trailhead called Nant. Route description: As noted, there are many trails leading to a key col just below the peak on its east side. 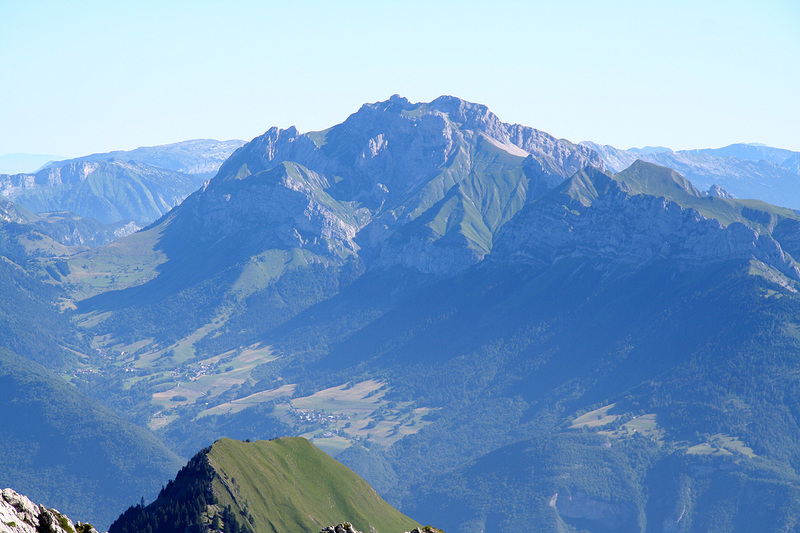 This col is named Col d'Orgeval and is located just where the route to the summit starts. We took what appeared from the map to be quite an easy way, starting from the skilift at Station de Seythenex. From this trailhead, take the dirt road that continues uphill from the upper end of the parking. Shortly after leaving the parking area, this road makes a sharp turn left, while the proper trail continues straight ahead. This trail is still large enough and has the character of a 4WD road. Hike this trail as it climbs up the valley, first on the left, then crossing the creek and continuing on the right hand side in the valley. 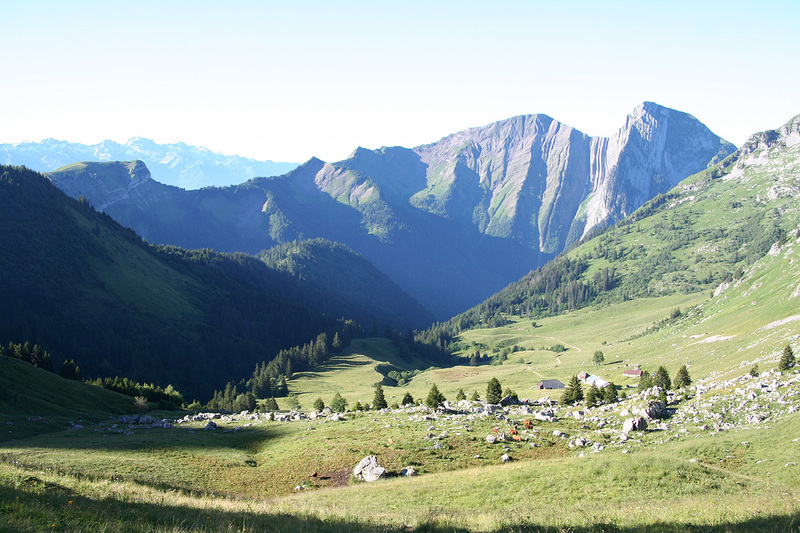 Higher up, the trail/road emerges into open grass-land and you see the mountain farm named Chalet de l'Aup de Seythenex (1719 m) a bit further ahead. This farm has a very nice location on a spur with great views around. 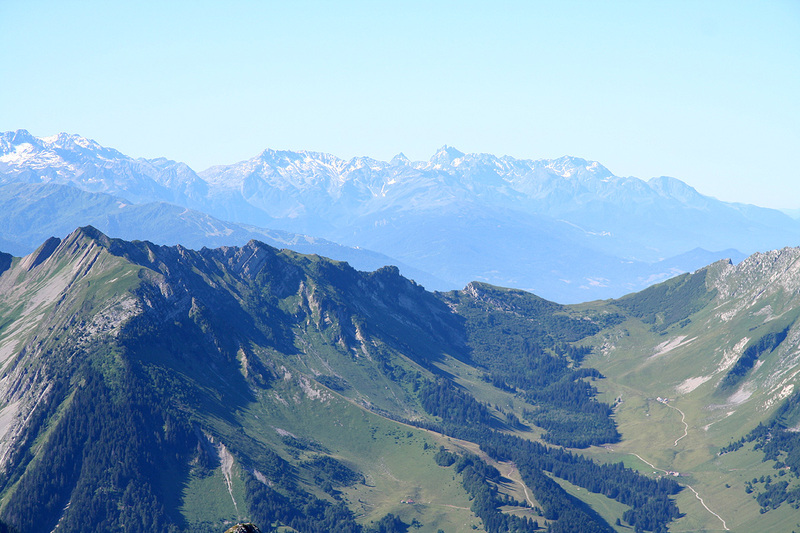 Walk right next to the farm and continue along the ridge, then curve right and gain a bit more of elevation in order to connect across to Col d'Orgeval without loosing elevation. 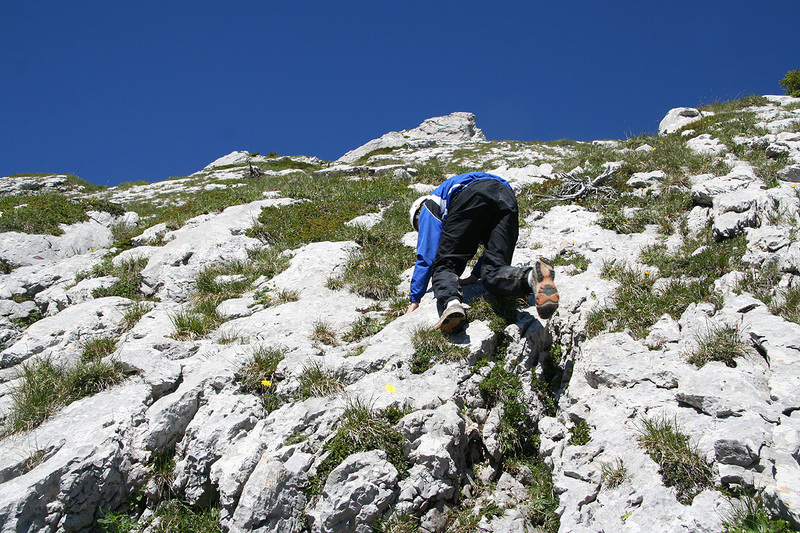 Here, this trail reaches its highest point at location N45:41.115, E006:14.777, elevation about 1870 meter. There is a trailfork here, another trail is coming from the west. 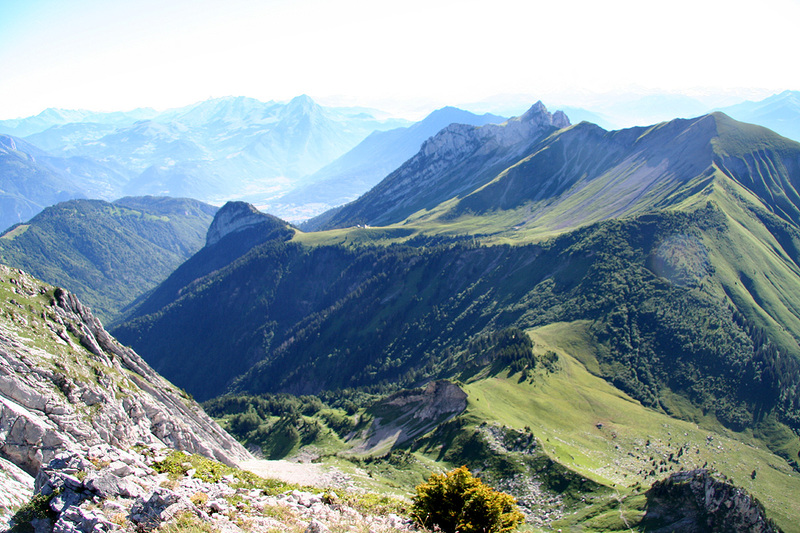 Descend about 140 meters to the main Col d'Orgeval (1732m), however the slightly higher col located a short distance further west is the place where the different trails serving this mountain all join. This place have coordinates N45:41.121, E006:14.380, elevation about 1750 meter. From this col, the trail that leads up the mountain heads directly west. Take this trail as it zig-zags up the first grassy slopes. The trail gets steeper higher up, but is well marked by paint and small cairns. This trail has several sections of (YDS) class 3 terrain. 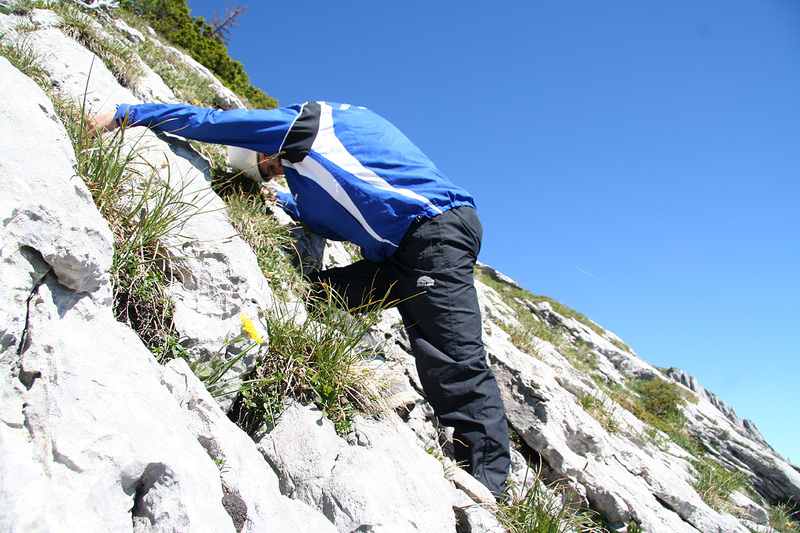 Under dry conditions, the limestone rock is good and there are always plenty of good foot and handholds. The trail finds its way upwards, there is a pretty long section where the trail traverses somewhat left before a final section moving right before gaining the top ridge shortly before the summit. The route is indicated on one of the photos below. 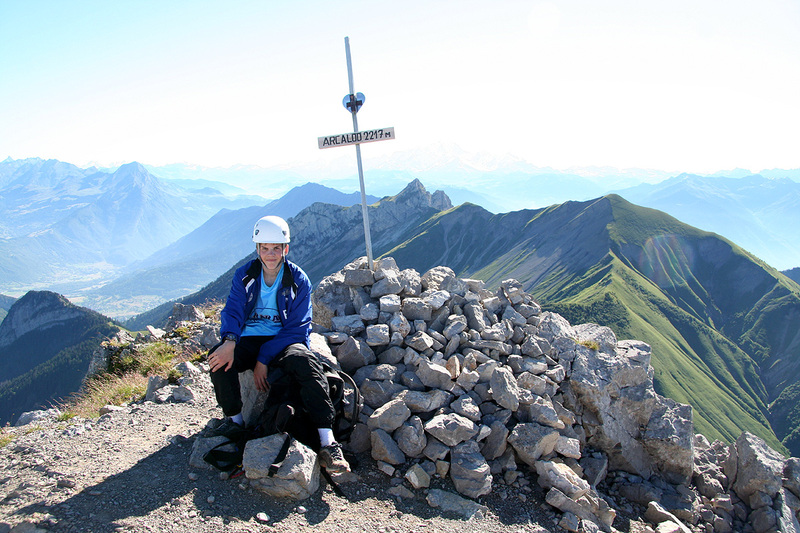 Comments: I did this climb with my son Pål Jørgen, age 18. We started out from the trailhead at 0655 and reached Col d'Orgeval at 0815 (1:20), this must be considered a good pace, it is starting to get tough for "old dad" to keep up with the youth. We rested in this col, the day looked good and we had not seen anybody this early. The view further south as well as north from Col d'Orgeval reflected this, peaceful and quiet with cows out grassing just south of us. We next started up the mountain itself. A couple of mountain goats walked peacefully a bit higher up. The route looked rather steep from a distance, but as often is the case, the problems sorted themselves out as we progressed up the mountain. We reached the summit at 0930 after a fun and leisurely climb. 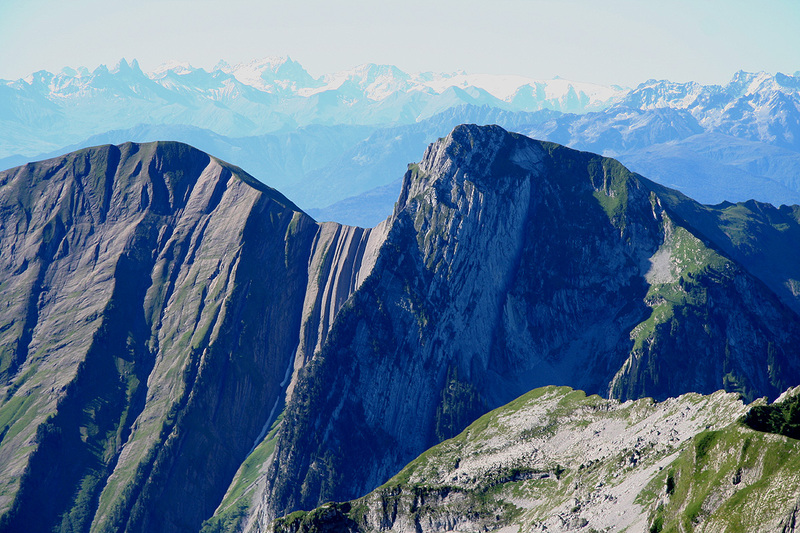 The view did not disappoint us, peaks and valleys all around. We took a good long rest, then left the summit at 1000. 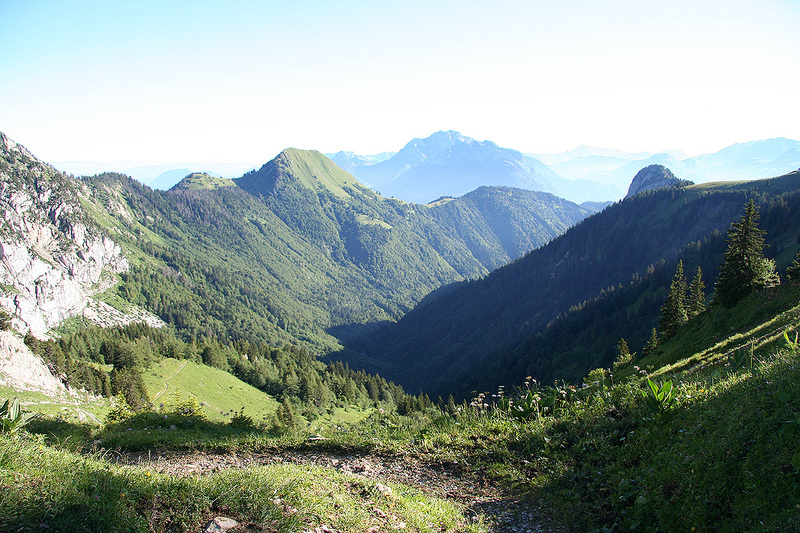 The descent back down to Col d'Orgeval required about 45 minutes. Near the col, we met two other hikers on their way up. We took another rest, then proceeded up from the col in order to return along our route of approach. The car was reached at 1205. On family summer trips like this one, we normally make for early starts with the goal to be able to have a common lunch (with my wife Heidi) after the mountain climb. We then have the entire afternoon together before a late dinner. This strategy is also good wrt. mountaineering considerations as the weather is normally best with good visibility in the morning hours. 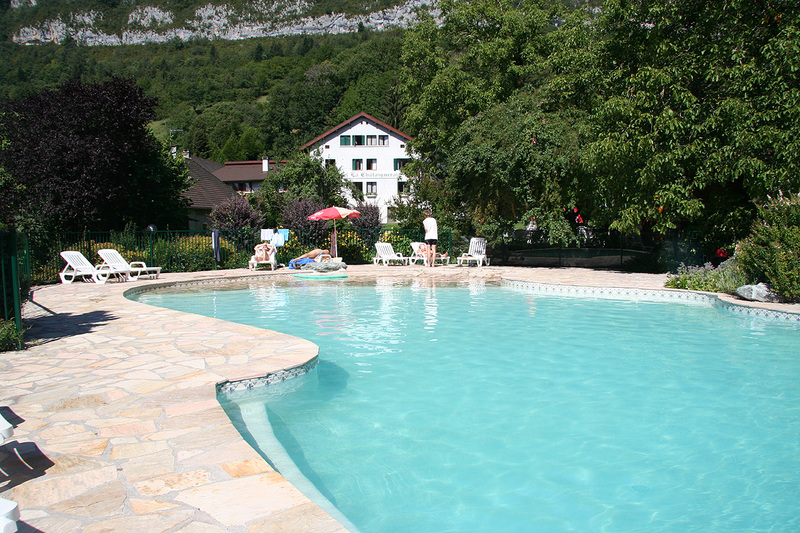 We had established a good "base camp" (with swimmingpool), in the valley between two European Ultras, just at the end of Lac d'Annecy. Our next goal would therefore be Tournette, making for a two night stay in the same hotel. The east side of d"Arcalod. 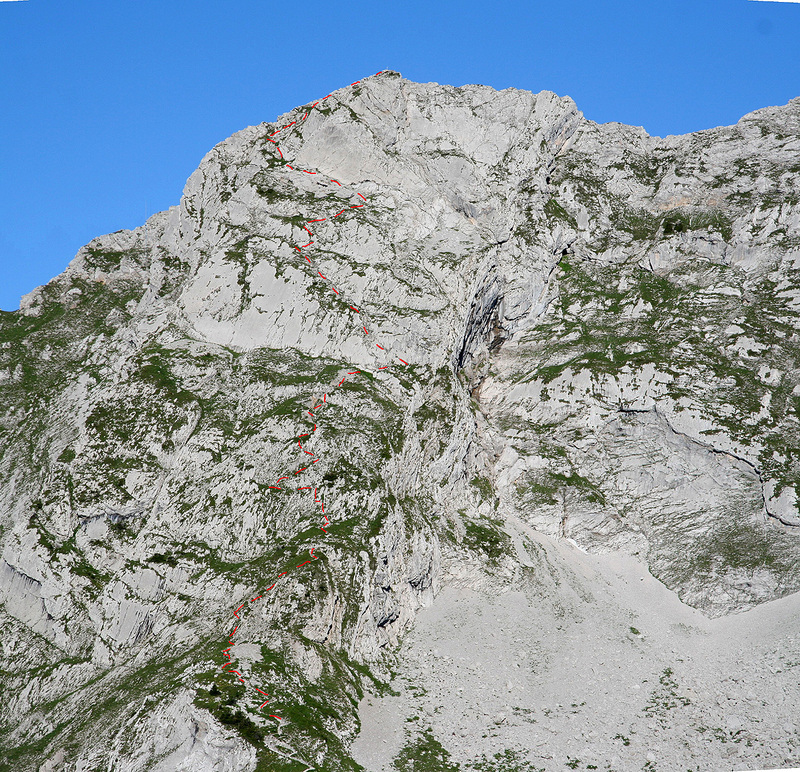 The climbing route is (roughly) indicated. The lower part of the route. Col d'Orgeval is straight down. One may notice the zig-zag path in the vegetation gaining the next basin as well as the farm buildings Chalet de l'Aup de Seythenex. Pål Jørgen is rapidly climbing higher. 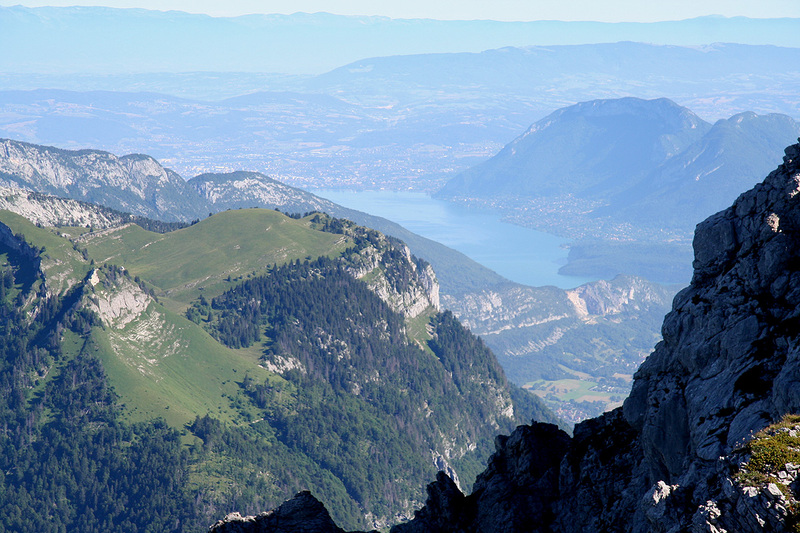 Lac d'Annecy as seen from the summit. Valley view from the summit. 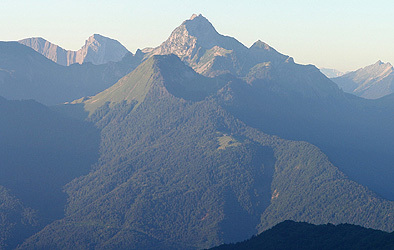 La Tournette, as seen from D'Arcalod. 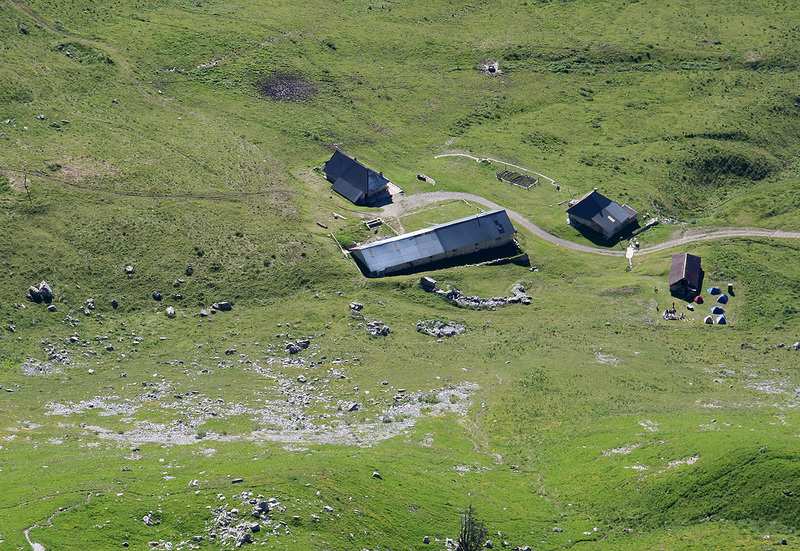 Chalet-d'Orgeval as seen from above. 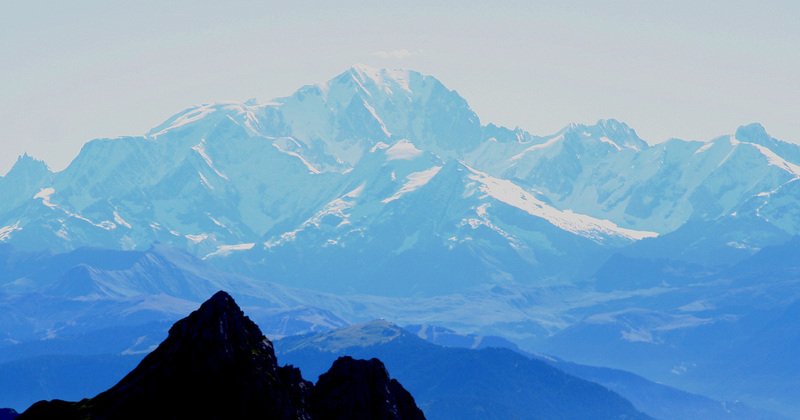 Mont Blanc as seen from Pointe d'Arcalod.